Fredericton may be best known as New Brunswick’s capital city, but it is also the home to one of the world’s best-known UFO researchers, Stanton T. Friedman. 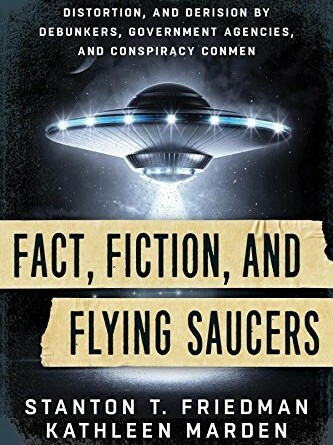 Friedman’s lifelong pursuit of the truth has lead to a stream of fascinating books, of which Fact, Fiction and Flying Saucers, written with Kathleen Marden (they previously co-authored Captured! The Betty and Barney Hill UFO Experience and Science Was Wrong), is the latest entry. Even for the most hardened and knowledgeable UFO buff, Fact Fiction and Flying Saucers should be essential reading. Both Friedman and Marden have built their reputations on solid research rather than rampant speculation. The result is a storytelling style that is both informative and rigorous. Fascinatingly, the book, in its final third, takes on portions of the pro-UFO community itself to expose fakers, frauds and dodgy claims. Fact, Fiction and Flying Saucers is a provocative and powerful entry in a controversial field. Whether you are a true believer or not, it’s a great reminder that there are still many more questions than answers to the UFO mystery.